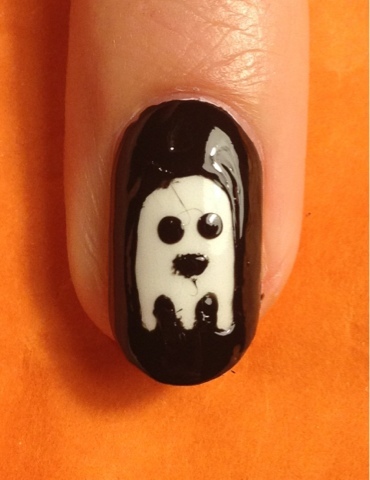 Today I've painted a Halloween design inspired by China Glaze Ghoulish Glow! I found this polish at my local Sally's Beauty Supply and had to create a fun design with it. This glowing polish turns a very bright green in the dark! 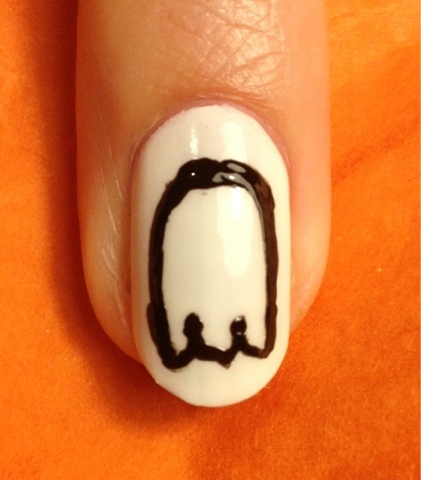 First paint your nail white for a base. 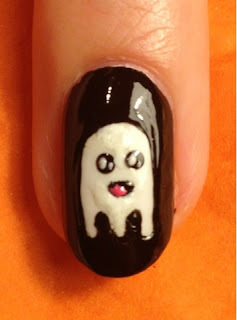 I used Essie Blanc. Paint two coats of glow polish over the white. I used China Glaze Ghoulish Glow. 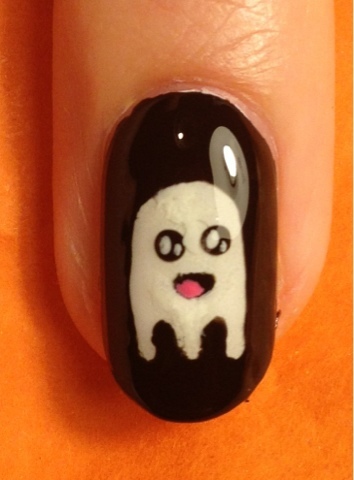 If you don't have access to glow in the dark polish white ghosts will be fine for this design. Using a thin small nail art or acrylic paint brush draw the outline of your ghost in black. I used China Glaze Liquid Leather. 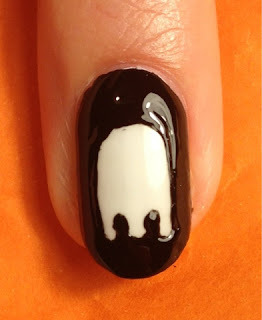 Fill in the outer parts of the nail with black. I used my small brush for this. Using a small dotting tool or the end of a bobby pin, dot two large eyes. Using a paint brush draw a mouth. The mouth can be any expression you desire. For this mouth I did an open smiley :D.
Now for the details! I used my small brush to dot white pupils and eye shines in the eyes and added a tongue with Essie Off the Shoulder. I went back over some of the ghosts body with white and then the glow polish to hide some small mistakes. To bring the details together and create a seamless look seal the look with a top coat. All done! 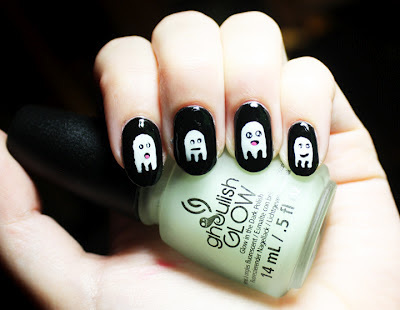 You will have cute little white ghosts during the day and green glowing ghouls at night. This will be my halloween mani!!!!! I love love love it!!! 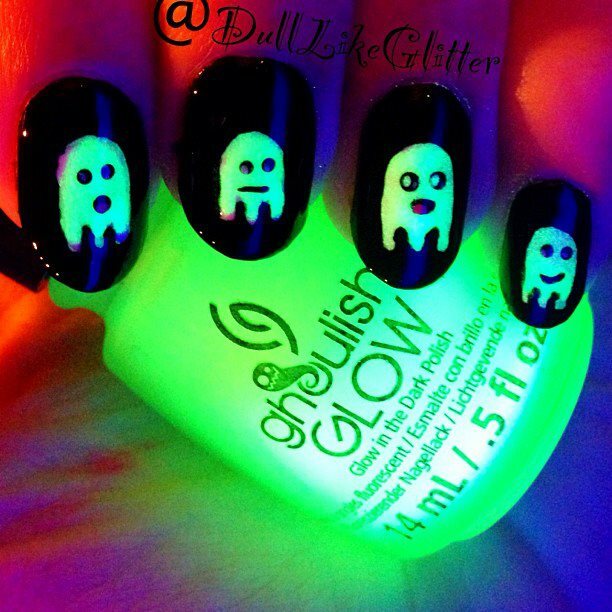 The glow in the dark polish is awesome!! 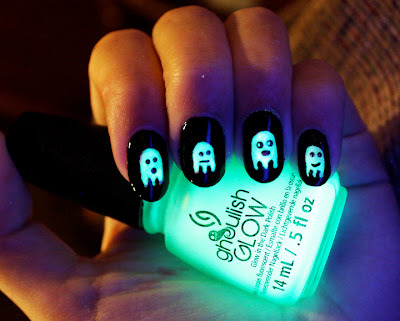 how do you photograph glow in the dark polish? I used a black light to photograph it while I had a light source as well. Taking pictures without flash in the dark is jut impossible to catch any glowing. Free Gift Cards with Shopkick!